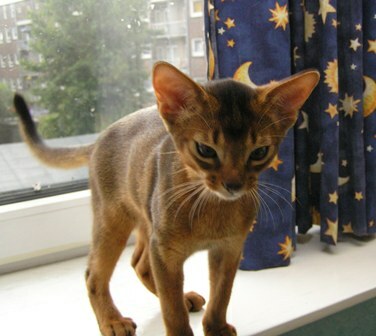 In 1987 I bought my first Abyssinian from a newspaper advertisement. I went to look at the litter and came home with EC Ruddy Yorkey van Galoubie Koschka, a ruddy male. My parents had bred Siamese cats for a few years so I thought it would be fun to take Yorkey to a show. At that show Yorkey got his first “Best of breed”. This was the beginning of his show career, that led to him becoming the first ruddy FIFE Euro Champion in The Netherlands. As a breeding male he produced beautiful offspring. He went over the rainbow bridge on November 19 2001 at the age of 14,7 years. One of his granddaughters, Rød Gentle på Detrevande was my breeding queen for a long time. She was diagnosed with cancer and went over the rainbow bridge on March 23 2005 at the age of 13 years. Those two cats were the early foundation of my breeding lines and they are still behind some of my most recent females. I have had great cats in the past and everyone of them was special to me. Like GC Chrisland Tomasina of Detrevande who was my first US import. Later I also got Abyoch’s Jumanah of Detrevande and Abyoch’s Daphne of Detrevande from the US. Jumanah was a part of my household and a leading lady for a long time. She went over the rainbow bridge on November 30 2007 at the age of 11,10 years. I try to keep my group of cats small and that sometimes limits my breeding plans but for me and my cats that works best. A few years ago I introduced a new male SC GC Clarion LittleManTate of Detrevande, DVM, DSM to my cat group. This little man stolen my heart and is charming my females. He is a sweet, well socialized cat. I feel fortunate to have him in my home. I thank Karen Helmrich and Mindy Condon for trusting me with this sweet guy and Christa Josemans for pointing me in that direction. My cats are raised in my home and I feed them a natural diet. They run around the house, up and down the stairs and sleep in the sun when the weather is nice. 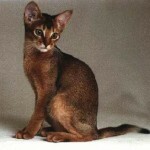 Abyssinians are famous for their nice colour and sweet character. They like the company of other animals and humans around. If they are alone all day, they pine away. Their character is extrovert, self-willed and intelligent. They have a remarkable way of telling you what they want. When you’re at home they follow you around the house looking and interfering with everything you do. When you have visitors, don’t be shocked if one of the Aby’s jump up on their shoulder to look who is there.